This module was supported by National Science Foundation (NSF) / Course, Curriculum, Lab Improvement (CCLI) Award #0127561 and National Institute of Health (NIH) / National Center for Research Resources (NCRR) / Science Education Partnership Award (SEPA) #1R25RR020425. We have created two functionally different versions of the Cocaine Lab. The first is the Basic Version, which is intended to be completed in one sitting. The Basic Version was the original version of the lab, and is often a good version to direct students to. The second is the Flexible Version, which was created later to add functions that teachers might find helpful. The Flexible Version is designed to allow teachers to present the lab in portions, or simply jump to a certain section in the lab. This Flexible Version is often reserved for teachers, but can be used very effectively with students. The Flexible Version of the Cocaine Lab has a special feature so the lab (which consists of 5 parts) can be started at the beginning, or at Part 2 or at any other part. This means the lab can be done over a period of several days. The 1st day students will start at the beginning and complete, say, the first two parts. The next day all students in the class can return to part 3 of the lab with one click of the mouse. The server will automatically registrater that all tasks for parts 1 and 2 have been completed. This gives teachers flexibility in breaking up the task. We have located the button for accessing the teachers section in the top lefthand corner of the main menu screen. 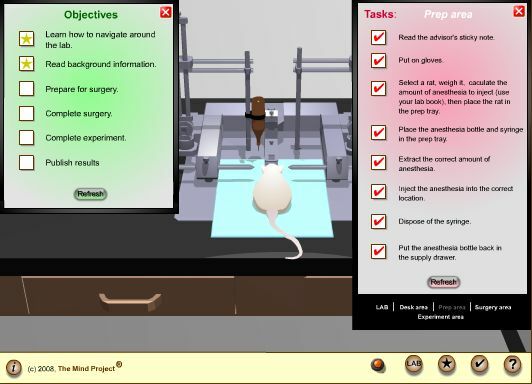 The teachers section is located at different places in each of our virtual labs, and is not present in the Basic Version. These locations are slightly covert so as to discourage students from gaining access to the "Jump Ahead" section. Once you scroll over the word, "teacher," in the corner, a tab will fold over revealing a button link to the "jump ahead" teachers portion of the lab. Here you will see a link to each step in the lab. Clicking on each link will take you to the designated area of the lab and it will register with the server that all prior steps have been completed. For example, clicking on the third section "Surgery Area" you can see that the objectives & tasks for the prior area will indicate completion.